Easy installation system directly on top of the kitchen to avoid the hole for the additional faucet of the underfloor filtration kits. 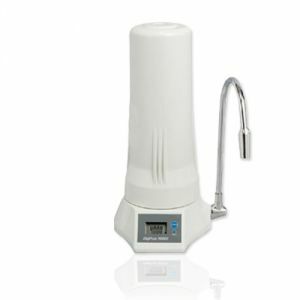 The system provides water for the whole family and for the well-being of the body that requires at least 8-10 glasses of water a day to regulate body temperature and to remove the excess toxins that accumulate during the day. 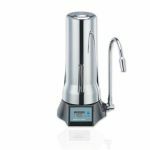 Indispensable for preparing coffee, tea, ice, pasta baking, concentrated juice soft drinks and great to offer your pet, very sensitive to chlorine, a pure and crystalline water. The connection is very easy and does not require the use of special tools for many types of faucets. The large screen LCD meter can monitor the remaining liters with a very accurate sensor before replacing the internal cartridge through an audible alarm and a continuous blinking of the LCD monitor. The system works with 2 AAA batteries lasting more than a year. When the batteries are replaced, the data remains in memory and the LCD monitor when it is not supplied is switched off in Standby mode. The quick-change cartridge is replaced by inserting it into the appropriate housing without the use of any tool. 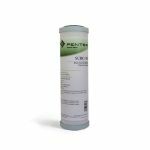 AT THE FIRST FILTER CHANGE WE RECOMMEND TO BUY THE PENTECK SCBC10 FILTER REPLACEMENT 0.5 micron below.